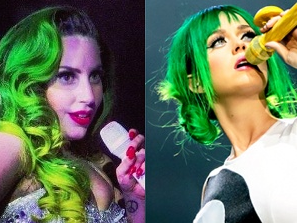 Lady Gaga shades Katy Perry for copying her green hair look and horse riding shtick. Feud alert! Lady Gaga appears to not be happy that Katy Perry is now donning green hair and riding on fake horses during her Prismatic World Tour. The Mother Monster tweeted on May 8 to her 41-plus million followers: "It looks like green hair and mechanical horses are the thing now," along with the emoji of a pair of googly eyes. Perry kicked off her world tour yesterday at the Odyssey Arena in Belfast, Northern Ireland, during which she rides a mechanical horse and sports green hair. Gaga, who has been vocal about being kind online, made quite the entrance at last year's American Music Awards when she arrived on a giant, fake white horse. The ARTPOP diva also recently did a shoot with photographer Terry Richardson where she rocked neon green hair. Gaga's jab comes just two months after the singer said on stage at the Austin Convention Center in Austin, Texas, "I don't know what the f--k-all I have to do with Katy Perry … Our music is so completely different. I couldn't be more different, really." The duo were previously paired against each other when their singles, "Applause" and "Roar," were released on the same day back in August. After the fact, Gaga went on record and told Ryan Seacrest, during an interview on On Air With Ryan Seacrest, that there's never been a feud between them "I really like Katy Perry and I like her fans," she said. Didn't gaga steal her entire career from Madonna tho? Lol I guess since ArtFLOP ain't selling and no one is interested in her anymore she's gonna go down the fake beef route to gain publicity. Lady Gaga has stolen just about her entire career from Madonna so she has no room to talk. Now GAGA knows how Madonna feels. But why does Gaga look like the joker in that pic??? Caca and her artfart fuckeries is as tired as the 10 layers of warpaint Katy Perry wears, both are overrated with mediocre talents. both are on the last 14 of their 15 minutes, caca 15 minutes been up.